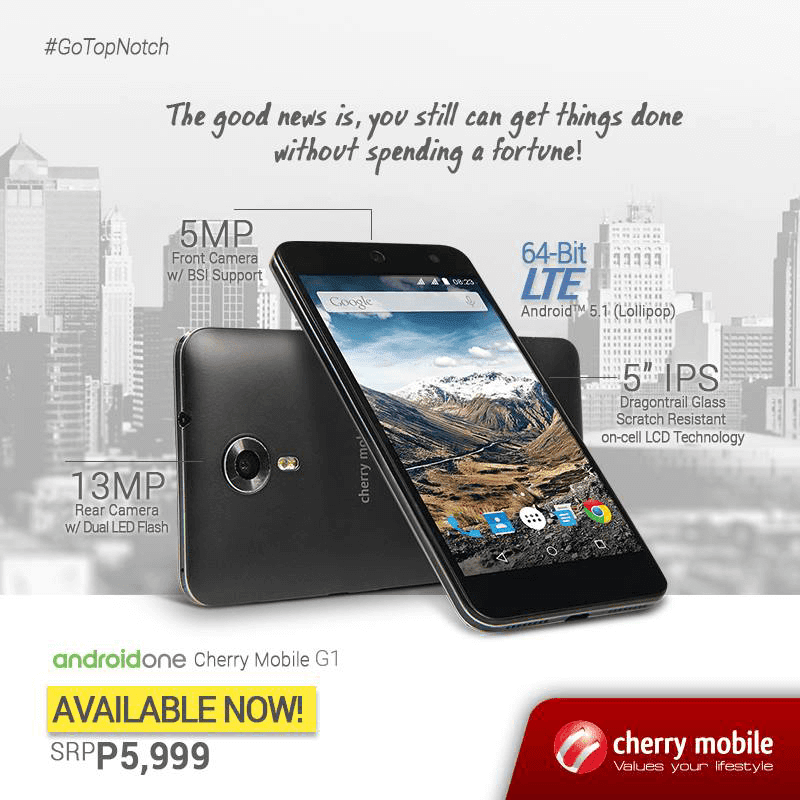 Cherry Mobile One G1 Now Available In Stores Nationwide For Just 5,999 Pesos! Home / cherry mobile / mobile / news / Cherry Mobile One G1 Now Available In Stores Nationwide For Just 5,999 Pesos! In a recent Facebook post, Cherry Mobile just announced that the much talked about Cherry Mobile One G1 is now available in stores nationwide. Hurry might sell like hotcakes! Why? The Cherry Mobile One G1 is a clear upgrade over the Cherry Mobile One and MyPhone Uno and it's now the most powerful Android One phone we have in town. It features pretty impressive specs for the price. It has a great 5 inch HD screen, 1.2 GHz Snapdragon 410 processor, huge 2 GB of RAM for the price, 13 MP rear camera, 5 MP selfie camera, LTE connectivity and 2,500 mAh of battery capacity which is big for the screen size! What's even more amazing here is it's a part of the Android One Program that means you'll get the update first every time Android has a new version or update. Aside from that Android One devices normally performs much better than regular Android phones not named Nexus.